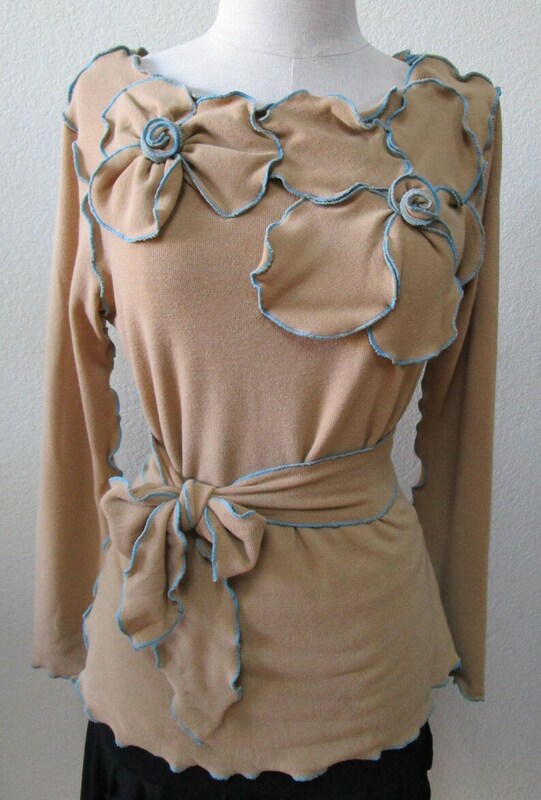 this is a light brown color long sleeves top with 2 roses decoration in the front top and it also has a optional belt that you can tie it in the front or even wrap around the back for more option. This item has blue stitching and ruffled edging throughout. It can go with brown skirt or jean will have you look gorgeous. This shirt is very flattering and comfy. Home run! very unique top, will shop again. love it, just what i need. thanks for the fast shipping. I accept Paypal, credit cards via Paypal and money order as my payment methods. Regretfully no refund, exchange same item or equal price item only. We only exchange for customer if within 14 days after delivery. The item must be returned unworn and in original condition. Replacement items will be sent only after I receive the item to be replaced. We don't offer refund because we only make one of each size for the item. It is not fair to the other customers if you buy it and return it. Please contact me for shipment address. We only can exchange once to the original item, but not to the exchange item. You need to make the right decision for the final exchange item. The customer is responsible for shipment expenses in both ways. I use US Postal service for my shipping service. I ship out the item in 1 business day after receiving the payment.